Thailand's military-installed government has lifted a ban on web sites linked to deposed Prime Minister Thaksin Shinawatra, including the popular Hi-Thaksin web site. 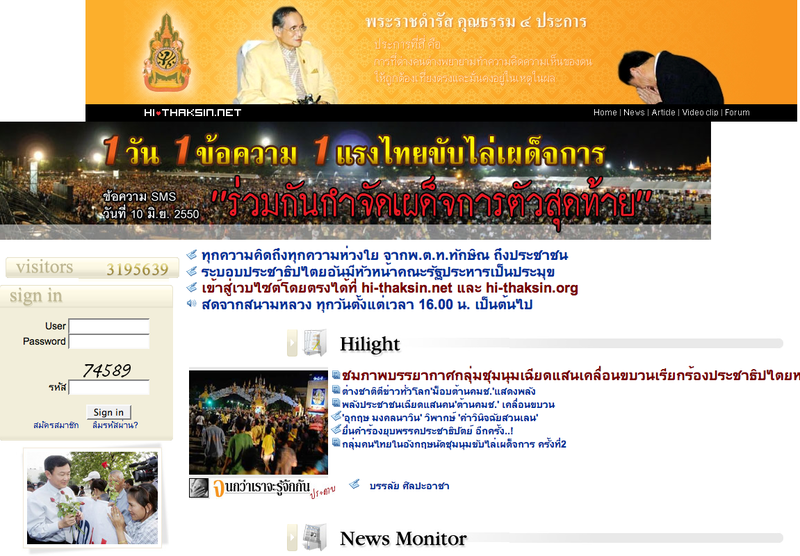 The move follows a high court ruling last week that dissolved the ousted prime minister's party, Thai Rak Thai. Earlier in the week, the military government removed a ban on political party activities, but Thai Rak Thai members are still barred from participation. Meanwhile, Thaksin said in an interview Thursday that he would like to return to Thailand from exile to live as a normal citizen once democracy is restored. Thailand's military-installed government has lifted a ban on web sites linked to deposed Prime Minister Thaksin Shinawatra, including the popular Hi-Thaksin web site. The move follows a high court ruling last week that dissolved the ousted prime minister's party, Thai Rak Thai. Earlier in the week, the military government removed a ban on political party activities, but Thai Rak Thai members are still barred from participation. Meanwhile, Thaksin said in an interview Thursday that he would like to return from exile to live as a normal citizen once democracy is restored.